Hello, I am new here to the forums. I am really hoping someone may be able to help me. I created a model using Zbrush, it was of course high poly so I used auto-retopology in 3D coat because I thought it would be easiest. What became of it was a model with clean topology, but way too much of it! Way too many polys than are necessary. I could have easily chopped down on them had I done it myself. So anyway, I chose to stick with the auto topo and try to edit it by removing highly retopologized areas with a lot of polys like the arms and legs. But the model was initially so small when it was retopologized that when I zoom in too closely the polys start to disapear. And it is near impossible to do from a distance. So auto did not work, I did it myself using the strokes and quads tool. Very clean and low poly, looked perfect. BUT!!!!!!!! 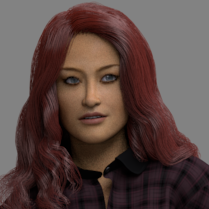 When I smooth it in Maya LT, the skin looks horrible, tons of dimply areas, not totally awful but not preferable. So I decided to keep a low poly look with the edges. And of course, what happens!? When I animate my character, because of the sharp edges, black faces sporadically apear. So now I have no choice but to smooth my mesh. I want it low poly but I cannot live with how horrible it looks after I smooth it. PS sorry for the change in font. Also I have already tried adding edge loops in maya where I want to retain the detailed edges but still the eye sockets are the biggest issue I have. Low poly model for game. 3D-Coat for texturing an bake all texture. Smooth subdividing to make a high res mesh? I would just like to smooth + subdivide a mesh imported into 3D coat to make it a high res mesh, then retopologize it in 3D coat as well. Normally I export the high res mesh from maya, But I've switched to modo indie which doesn't allow exporting a mesh with over 100k polies. Since I prefer retopologizing in 3Dcoat, it is possible to smooth + subdivide a mesh the way Maya or modo does it? I tried subdividing on import but it doesn't look the same. 3d coat send to maya ? I saw somebody over on the Newtek forums using Google Trends to gauge 3d software popularity over time, so I decided to try it out myself. Of course I don't know how scientifically accurate Google Trends is, but it is a lot of fun to put in some search terms and see what it comes up with! I decided to do two searches. My first search was to see which software programs are Autodesk's best selling products, and how their popularity has changed over time. I picked four that I thought would be big sellers, and I came up with this chart: According to this, it looks like Autodesk's AutoCAD products are currently their best selling software. 3ds Max used to be a really big one too, but it has declined quite considerably! Is Max losing popularity for architectural visualization? Maybe architects are just doing their visualization renders directly inside Revit now, or they are using visualization software like LumenRT, Lumion, Twinmotion, or even game engines instead. Also maybe game artists are quitting Max and moving to Maya LT. I also did a second search trying to see which 3d software is currently the most popular, and I came up with this chart: It looks like Blender and Cinema 4D are pretty steady over time. Maybe they have their user base locked in. That big decrease for 3ds Max and Maya is pretty stunning. But wouldn't the other software options increase if Max and Maya decrease? Where are those customers going? Have all the big studios just made their own software and they don't need Max or Maya anymore? Are there too many viable alternatives to Max and Maya out there now? I don't know, maybe these charts don't mean anything important really, but it is definitely fun to have a look and wonder about what is going on! What do you all think? Hi because there is not a triangulate or normal softening option in 3DC's retopo room, i had to triangulate and smooth the mesh normals in maya. When i import the triangulated mesh to unity i get this see that dotted line? that happens to every quad that has been triangulated in maya. that edge changes it visibility at different viewing angles... it suggests there is something wrong with the geometry; Any ideas why this happens? Hello, i was wondering could someone help me i have been paining my maya model in 3d coat and its just that the colors i apply look so fake or just weird. i know the model is not fully colored i stopped due to the weirdness/oddness of the colors and came to here for help. So basically im asking how to make the color look vaguly better and not fake or like they were applied by a bucket.